And the most anticipated Rock musical finally hits Manila. And we are given not one but two ways to enjoy it. Through the silver screen of a cinema and live on a theater stage. So take your pick. I already saw the film version last Tuesday and I will be seeing the live tonight. I will be having my reviews by tomorrow or the weekend. 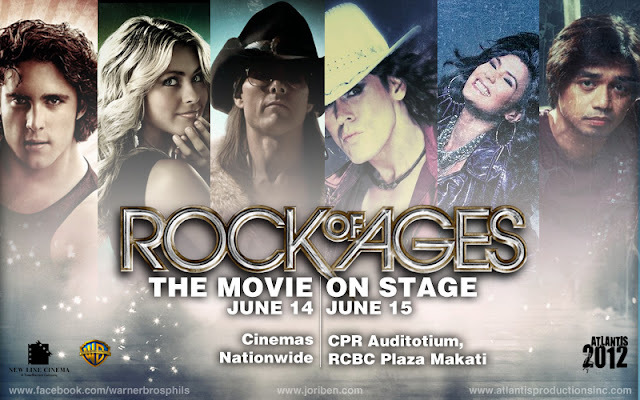 Rock of Ages the movie premieres today (June 14) on all cinemas nationwide from Warner Bros. while stage version opens tomorrow, June 15 at the Carlos P. Romulo auditorium, RCBC Plaza Makati. For tickets visit www.atlantisproductionsinc.com or call 892-7078.
nope. the theater is just small, so no need for LCD screen.